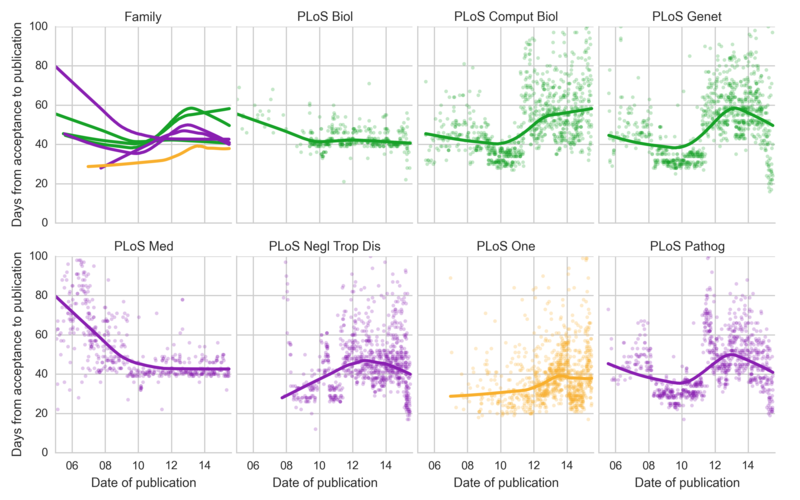 On April 22, 2015 my research was formally accepted to PLOS Computational Biology. 68 days later the article has yet to be published. My current projectbuilds on the forthcoming study and would benefit from its publication. Frustrated, I decided to investigate whether such delays are commonplace atPLOS. I started by retrieving all PubMed records for the 7 PLOS journals. For each journal, I randomly selected 1000 articles and scraped the PLOS website for receival, acceptance, and publication timestamps. Using this scraped data, I plotted publishing delays over time.